The Intense Series 6100 are very high brightness, 980nm single mode lasers with up to 200mW of kink-free power. These high beam quality lasers have low astigmatism and a Gaussian far field. Manufactured using Intense’s patented Quantum Well Intermixing (QWI) technology, the Intense Series 6000 are among the most reliable high power, single mode lasers in the industry, with more than 11 million hours of device operation at 25°C. The lasers are available in a wide selection of industry standard packages, including 5.6mm, 9mm and C-mount. 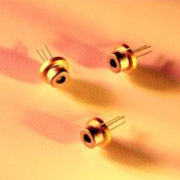 Photodiodes are optional for both the 5.6mm and 9mm packages. Custom wavelengths are available on request. Power levels under 100mW are also available. Applications include a variety of print and imaging, point-to-point communications, medical imaging, optical storage, sense and detection, aerospace and defense.